Your brand is your identity. You can argue that it’s your company’s most valuable asset. You have insurance to protect your people and your equipment, but how do you protect your brand? That’s what a trademark is for. Trademark law is complicated, but it’s important to understand the basics—at least enough to know when you need a professional’s help. As an HVAC marketing agency, we see many contractors become victims of trademark infringement, and we also ensure the work we do for our clients doesn’t get them into trademark trouble. Because we name companies and develop brands, the KickCharge Creative team hears a lot of questions related to trademark. These questions and answers were the subject of a recent KickCharge U webinar hosted by KickCharge President Dan Antonelli and trademark lawyer Charles Internicola of The Internicola Law Firm. This blog post provides a recap of the nuts and bolts they explained – but you can watch the webinar recording here. What are the differences between copyright and trademark? 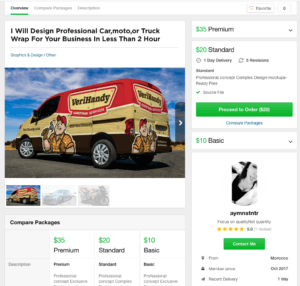 Crowdsourcing websites falsely use KickCharge Creative’s work to advertise their design services. Both are forms of intellectual property protection. A copyright protects original works of authorship such as books, movies, songs and website content. A trademark protects the things that identify a business (the source of goods or services). They include name, logo and tagline. Do you have copyright and trademark protection automatically? Yes, but it’s limited. In both cases, registering your copyright or trademark enhances your protection. If you want to sue to enforce your copyright protection, it needs to be registered, so it’s worth taking this step for a work of significant value. You have common law trademark simply by using your name or logo in the marketplace, and that can be enough to protect you if a local competitor tries to use a brand that’s confusingly similar. But without a registered trademark, you can’t challenge its usage outside of your area. How do I protect my new brand? When you start using a new company name or logo, use the ™ mark to signify that you are claiming trademark protection of your brand. Apply for registration with the U.S. Patent and Trademark Office. When you receive your registered trademark (it can take up to one year to complete the process), replace the ™ with the ® mark. What should I do if someone steals my brand? If you discover someone else using your name or brand—or something confusingly similar—you should consult a lawyer to file a cease and desist order that would force the offender to stop using it. If your brand is not registered but the violation is in your market and you used the name or logo first, your common law trademark should be effective enough. You need a registered trademark for your cease and desist to have enough power outside of your service area. Once you’ve pursued a cease and desist, be sure to follow through. Do not establish a record of not enforcing your brand protection. How do I make sure I’m not using a stolen brand? 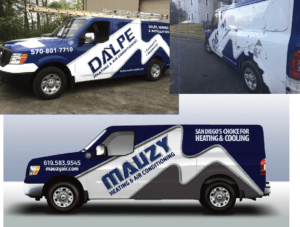 A sign shop sold this Pennsylvania contractor a vehicle wrap design modeled after the one KickCharge Creative designed for Mauzy Heating Air & Solar in San Diego. The Pennsylvania company needed to rewrap its trucks with a modified design. Beware of crowdsourcing sites because you cannot be sure the brand they create for you is original. KickCharge Creative has seen countless examples of crowdsourcing design sites, logo contests and sign companies selling unknowing companies a brand design they stole from someone else. Many designers on such sites even use KickCharge images to advertise their design services! If your brand is not original artwork or it’s clipart, you enjoy no trademark protection. Hire a professional and do your due diligence. You can search your company name in USPTO.GOV to ensure it’s not already trademarked. Also, check the business registry for your state and do simple Google searches to see whether it’s in use. What happens if I get caught using a stolen brand? You’ll likely get caught, and it’ll be an expensive lesson to learn. If you wrapped your fleet using a stolen design, you’ll need to strip the wraps and start over. Toss your printed materials and uniforms. Our web design company in NJ has seen companies that needed to redesign their websites, too, because they used a stolen brand. Don’t make this pricey mistake. It takes time and costs more money to develop your brand professionally and to pursue legal counsel, but both are worthwhile endeavors that will prevent serious problems in the future. Learn more about the KickCharge Creative brand development process, and then let us know if we can help you answer any questions. The mascot we created for Timo’s Air Conditioning & Heating in Palm Springs, Calif., is often poorly imitated.